Teenagers today seem to enjoy taking words and employing them as a new part of speech, especially if it results in the use of fewer syllables. Thus we have the verb fail used as a noun in place of failure, the verb invite used as a replacement noun for invitation, and so on. This has given us such linguistic classics as what an epic fail or where’s my invite. My teenage daughter has managed the inverse transformation, telling me that she has “no time to piano today”. Texting and Twitter can be blamed for much of this, of course, but the hurricane community’s gift to the Lexicon of Lazy Locutions originated nearly two decades ago. The noun that represents our particular role in the decline and fall of the English language is the subject of today’s blog post. If you lurk around the dark meteorological corners of the Internet, or even if you just watch weather broadcasts during hurricane season, you’ve probably come across expressions like Invest AL94. With the accent on the first syllable (IN-vest rather than in-VEST), this is not an insider’s instruction to sell your AAPL stock at $100, but rather it’s a reference to a specific “investigative area” – a weather system for which a tropical cyclone forecast center is interested in collecting specialized data sets or running model guidance. NHC has responsibility for identifying these invests, or disturbances of interest, in the Atlantic basin. NHC and the Joint Typhoon Warning Center (JTWC) have shared responsibility for designating invests in the eastern Pacific, while the Central Pacific Hurricane Center (CPHC) has this responsibility in the central Pacific. The rest of the globe (for this purpose at least) belongs to JTWC. NHC, CPHC, and JTWC prepare their forecasts and advisories on a computer platform known as the Automated Tropical Cyclone Forecast system (or ATCF). Tropical cyclones are followed on the ATCF using identifiers such as AL032014; this particular identifier would decode as the Atlantic basin’s third tropical cyclone of the 2014 season. Invests are given identifiers using the numbers 90 through 99 in place of the cyclone number, so the first Atlantic invest of 2014 was AL902014, or AL90 for short. After AL992014 is used, we would cycle around and reuse AL902014, so unlike the ATCF identifiers for true tropical cyclones, invest identifiers are not unique. 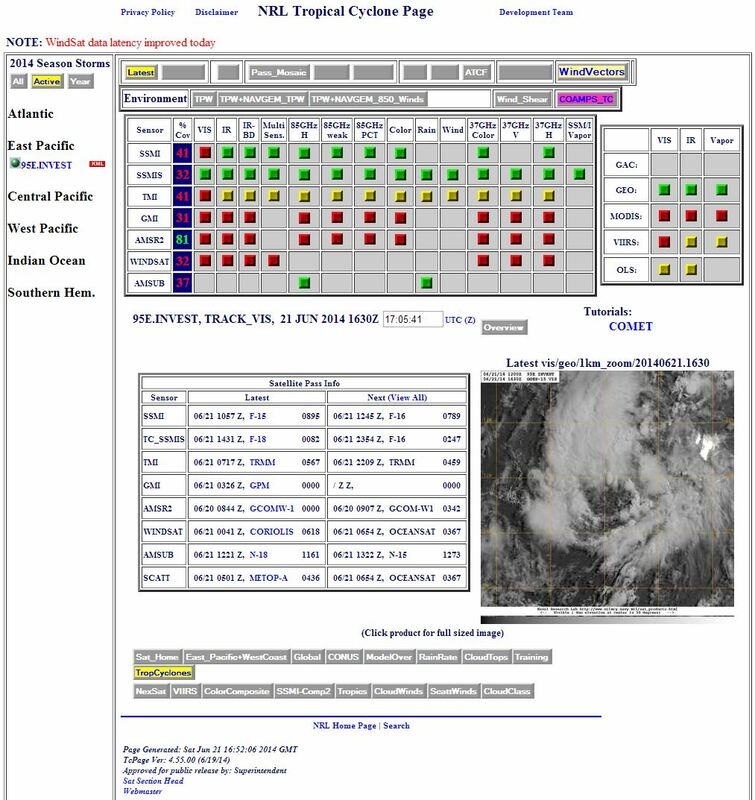 Example of the Naval Research Laboratory Tropical Cyclone web page from June 21, 2014. Once NHC or one of the other forecast centers “opens an invest”, data collection and processing is initiated on several government and academic websites, including those at the Naval Research Laboratory (see example to the right) and the Cooperative Institute for Meteorological Satellite Studies at the University of Wisconsin. Information on these sites, along with the standard suite of models run on the invest, then helps NHC prepare the genesis forecasts that appear in the Tropical Weather Outlook. It’s important to recognize that the designation of a disturbance as an invest does not correspond to any particular likelihood of development of that system into a tropical cyclone. 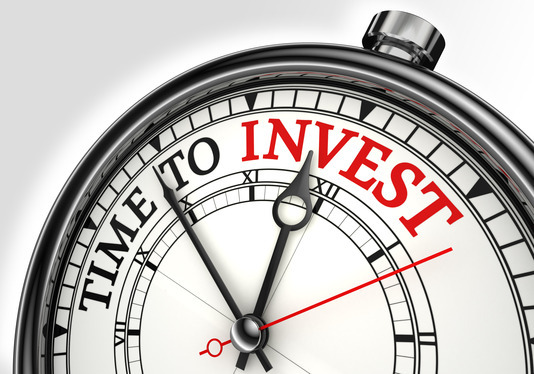 Indeed, we will open an invest in part to help us determine what that likelihood is. Also, and particularly near the beginning of the season, it’s not uncommon for NHC to create one or more invests solely to test data flow or model processing scripts. The Tropical Weather Outlook should always be consulted to determine the significance or potential threat of an invest disturbance. ATCF databases have traditionally been posted to NHC’s public FTP server to facilitate the exchange of information with modelers and other quasi-operational groups, and to make model guidance available to the private sector. Unfortunately, posting of the ATCF data to the FTP site allowed some pre-decisional information to leak out to those who knew exactly where to look. For example, one could find the command that renumbers the invest system AL902013 to the tropical cyclone AL012013. Renumbering an invest is a process the NHC Hurricane Specialist needs to invoke in order to prepare the first advisory on a tropical cyclone, even though the final decision to release that advisory might not be made for another hour or two. In the early years of the FTP site, these leaks seemed to fly under the community’s radar, but over time had become increasingly known. Anticipation of new cyclones began to cause problems for us and for our partners in emergency management and the media, some of whom would infer or even prematurely announce that we were going to start advisories. (And indeed, occasionally we’ve had to change our minds and not initiate advisories on a renumbered invest). In 2014, NHC has made some changes to how data from the ATCF get publicly posted. The most significant of these is the establishment of a blackout period, during which changes made to the ATCF storm ID and some other parameters will not flow to the FTP server. The blackout period begins 90 minutes prior to the nominal advisory release time (e.g., 9:30 a.m.) and ends at the nominal advisory release time (e.g., 11:00 a.m.). Quasi-operational websites that make use of ATCF data will now draw their data from the FTP server rather than NHC’s internal databases. In this way, everyone will be able to learn about an NHC advisory, and know for sure that it’s coming, all at the same time when that advisory is released. We want to emphasize that while the blackout period will restrict the release of pre-decisional information, it will not restrict the distribution of model guidance used by private-sector forecasters. 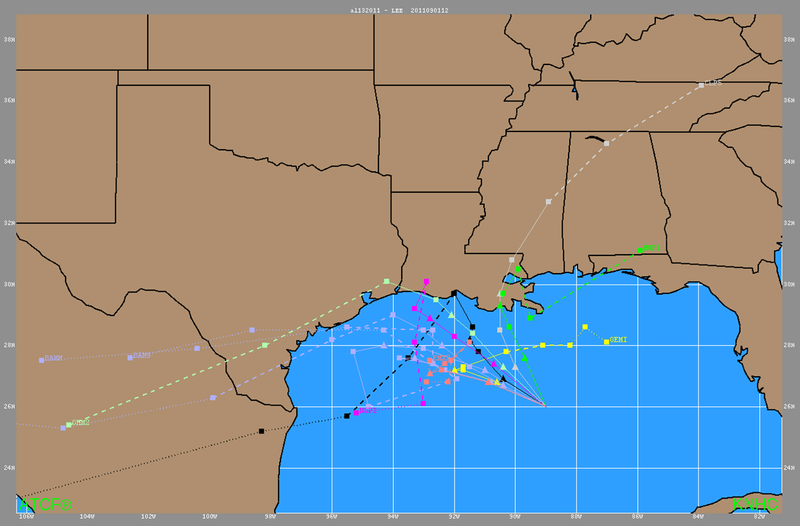 Track models from the ATCF for Tropical Storm Lee in 2011. This entry was posted in Forecasting, NHC and tagged ATCF, invest, models.